It's day 2 of our Transformers Generations Wv.2 Combaticons! Today, we take a look at the second leg of the Decepticon's massive powerhouse Bruticus, Brawl! He's an angry Tank-bot that just loves to pummel Autobots. I know I'm doing these out of the numerical order that's been printed on the package; Swindle being 4 and Brawl being 5, but I'm working my way up. So, let's take a look at the Combaticons loud and raging tank after the jump! As his name implies Brawl is a brute; and he makes sure you know it. Brawl thunders through the battlefield; yelling, firing off massive amounts of artillery, and even transforming between Bot and Alt modes loudly... and if that weren't a problem, his uncontrolled rage just might be. Look at him wrong... and it's visual receptors out. Brawl comes packed in the new standard for the Generations line, a well detailed red card. We get some beautiful card art of Brawl's Bot-mode with card insert showing off his Alt-mode. Once again, Hasbro decided to give us some Engrish lessons... "BUILD GIANT ROBOT!"... it makes me laugh every time. The card-back gives us the usual 2 mode shot, Bio, Tech-Spec, and placement of Brawl in the greater scheme of Bruticus. As of this writing, I noticed I didn't take a pic of the entire card-back... I'm sure you can extrapolate it. First impression out of the pack? Like Swindle, Brawl is LIGHT. He has a little more heft that Swindle, but not much. I didn't need to fix any joints or complete his transformation like I did for Swindle with the exception of folding out his feet. Continuing the Fruit-Stripe theme, Brawl is GREEN. Very, very green. He is molded entirely in green and black with a few silver paint decco's, yellow for his visor and purple for the Decepticon shield. Brawl's cannon, like his G1 counterpart, takes up most of his back. It hinders some of the articulation if you want to have his legs in any pose that requires them to go back. His hands fold into his forearms and being a hinge and not a ball joint, the articulation is limited. Brawl comes packed with what amounts to a pistol. Because you know... Brawl needs more firepower. While his back cannons look great, they really have no way to function as forward-firing weapons in Bot-mode. Getting Brawl to Alt-mode is a little more complex that Swindle; he folds up rather well. Fold Brawl's head down and forearms in. Brawl's arms rotate up and his forearms rotate around, line up the black and snap into place using the tabs and slots on the arms and body. Fold the feet in and rotate Brawl's legs inward. Push his crotch up and fold the legs up at the knee and pop them into place so they meet with the torso. Fold the connector post down and swing the back end of the tank down and snap int into place. Brawl's cannons can be rotated to fit the look you like. You'll notice there is a tab on each barrel, that will come into play during leg-mode. There is a post hole at the front of the turret that Brawl's pistol can fit into, giving his Alt-mode even more firepower. Brawl's Cybertronian tank mode is ready to lay down some pain! Getting Brawl into leg mode requires a little more than just standing him on end. Rotate the front end (arms) outward, you'll notice some tabs that will come into play in a bit. Rotate the cannon to face backwards and lift it forward towards the front. There is a small clip that will snap the turret into place. Swing the turret cover out, it has two slots for the tabs on the arms to snap into. Swing the rear of the tank up, over, and down and connect it to the gun barrels using the two tabs provided. Rotate the connector port up, and Bruticus leg! And of course, we have to compare Brawl to Brawl! Like Swindle, the appendage mode proportions are REALLY close. The Bot and Alt modes however, the size difference is really noticeable. Now... like Swindle, Brawl has an Alt-appendage mode. The black piece on the outside of Brawl's lower leg folds out to be two fingers. So, his legs have to be connected together to make a full hand. Then, either one of his feet can be folded out to be a thumb. Based on how everything moves, I believe this is what Brawl would look like in Arm-mode. Like Swindle having an alternate appendage mode, I would bet that this transformation will be used for the Wreckers combined form, Ruination. Like Swindle, I'm happy that I could get Brawl. 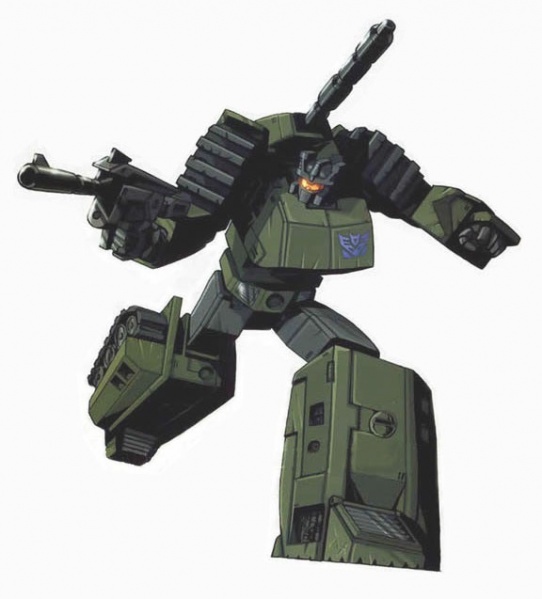 Out of all the Combaticons, he was my favorite. I just like loud, destructive characters. I love them for their pure simplicity. No motive, just wrack and ruin. Brawl is a soldier, a grunt, a minion... he knows his place and he loves it and what he does. Brawl's new figure is nice overall. His Alt-mode is a solid piece and his Bot-mode works; but I'm sure my Brawl will remain as a leg for the duration of his display. Hopefully you can find your own set of the Combaticons at your own local Toys R Us... good hunting! Next, we move up the body and give the legs something to support... Bruticus' main body, Onslaught. Pics, review, and much ado by Scion of Primus. I enjoy studying and I conceive this website got some truly utilitarian stuff on it! . Very nice review! Brawl also has his "main guns online" mode from FOC. It's mainly pulling out his limbs into a crab-like position and lifting up the main cannons. Once I eventually find him, I'll post on it.